Berkeley has a fascinating networks of paths around town, and remarkable selection of parks, large and small. Their “Berkeley and Its Pathways” map is a “guide to all 136 of the picturesque public stairways, ramps, and footpaths that make walking in our city so engaging.” The map includes the Ohlone Greenway, Santa Fe Right Of Way (the railroad ran across town when I came here in 1974) and some paths in adjoining cities. And as it turns out, I just went on a walk this morning! The Berkeley Marina and Cesar Chavez Park are great places to play. Shorebird Park and Adventure Playground are great for kids. Cesar Chavez Park is perfect for kite flying, well behaved dogs and hosts festivals and the 4th of July celebration during the year. 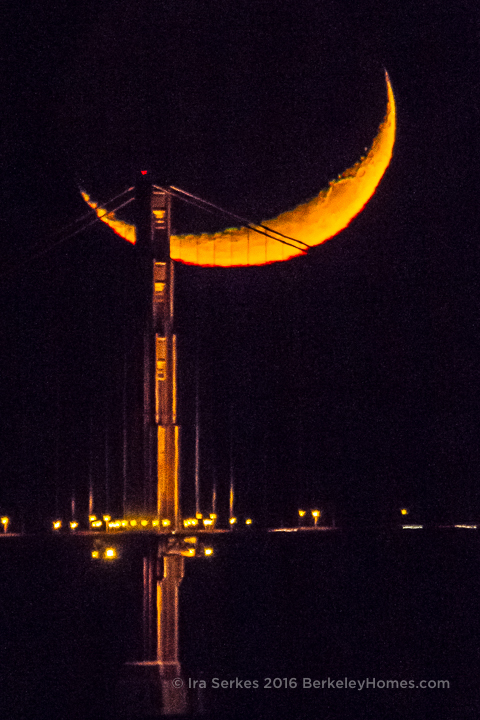 The park’s a wonderful place to place to watch the sun or moon set behind the Golden Gate. 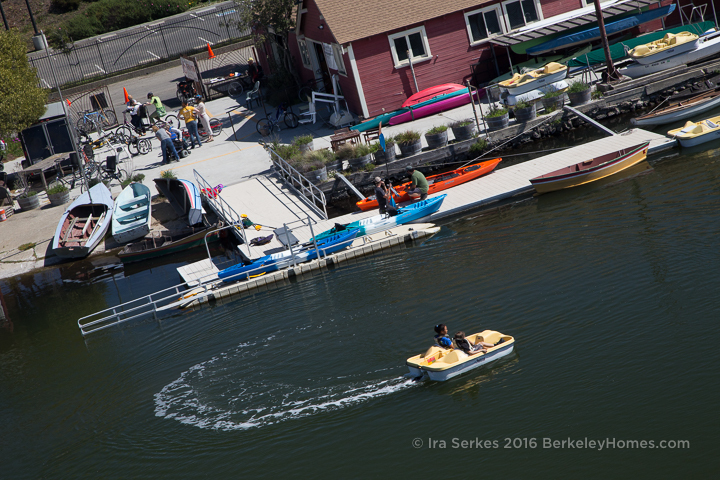 It’s a marina … so you can even travel the bay aboard your sailboat or a Hornblower Yacht dinner cruise. You can get to the marina by walking or biking over the green pedestrian bridge from the foot of aquatic park. The Sea Breeze market, a pleasant place for a quick bite, is just the other side of the bridge. Take the Bay Trail along the waterfront from Emeryville to Richmond. 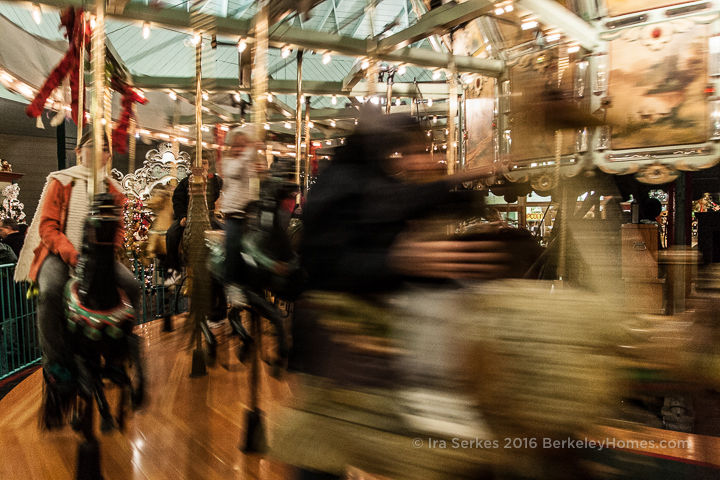 Tilden Park, just past Grizzly Peak in the Berkeley Hills has a Little Farm, Golf Course (my brother Bruce hit a hole-in-one there), merry-go-round, botanical garden, and even a live steam ride! 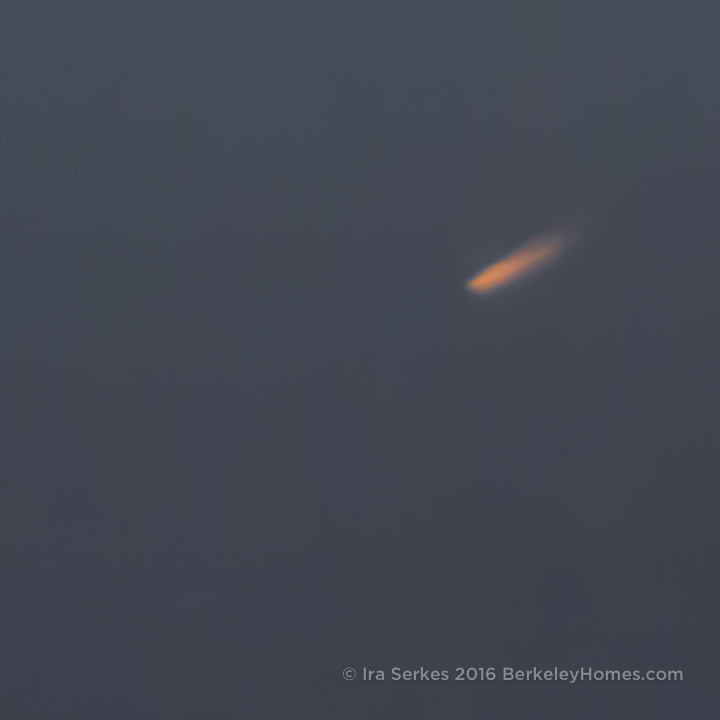 Inspiration Point is where I go to catch the morning sky … sun, crescent moon, and planets … and once, a comet. 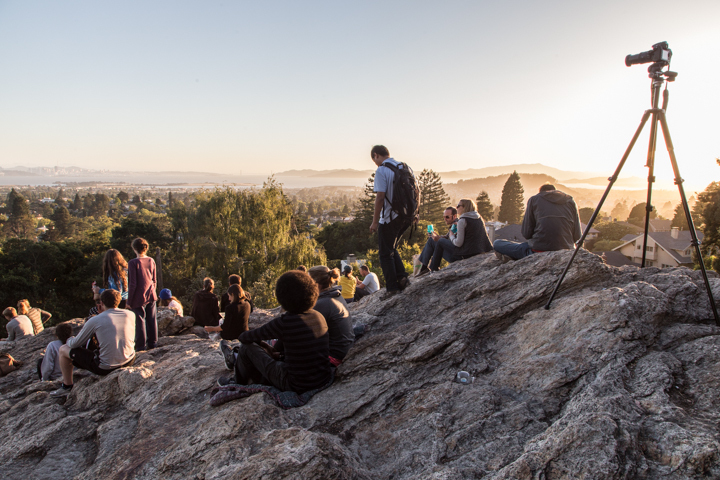 Grizzly Peak has a spectacular view of the bay, perfect during the day or at blue-light twilight. 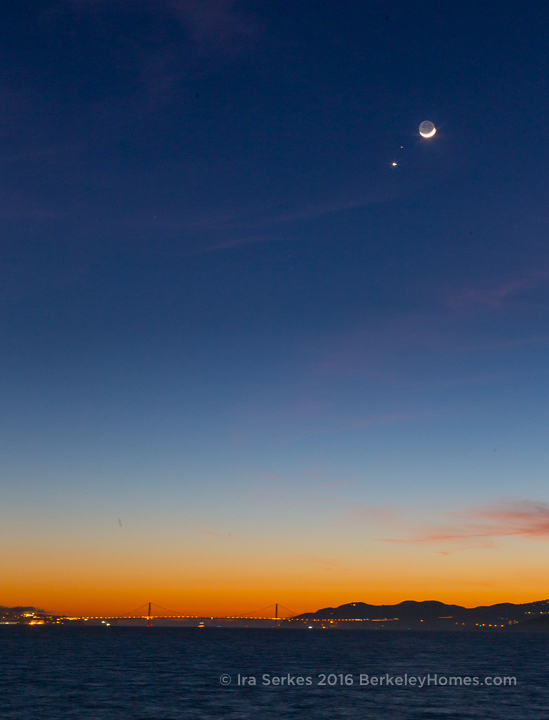 It’s particularly lovely when everything’s in alignment … like the crescent moon, Venus & Mars were this night. 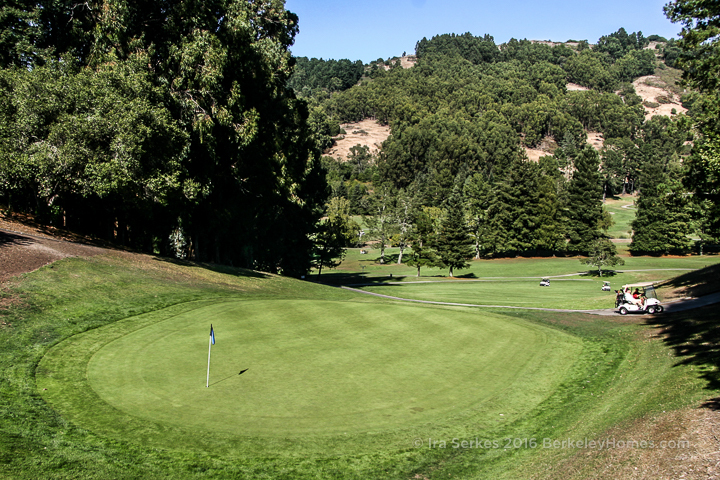 Berkeley has several parks among the rocks! 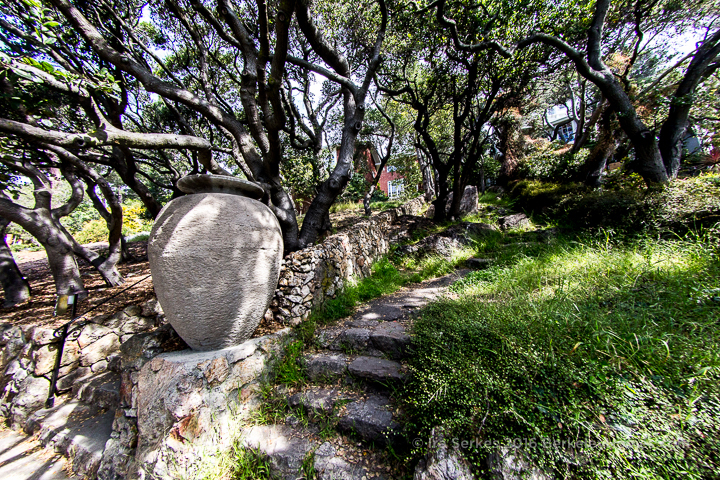 Indian Rock Park is perfect for sunsets; you can also climb about Contra Costa and Cragmont Rock Park, and marvel at the Remillard Park monolith. Need a break? 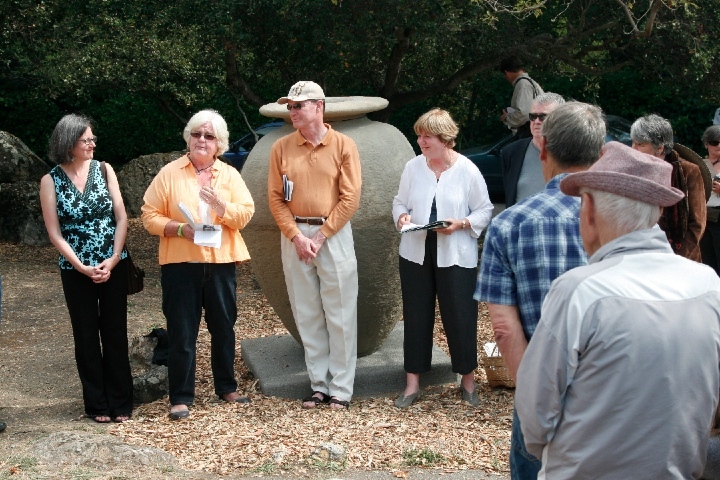 Smell the roses at Berkeley’s Rose Garden, a WPA project. Things looking down? 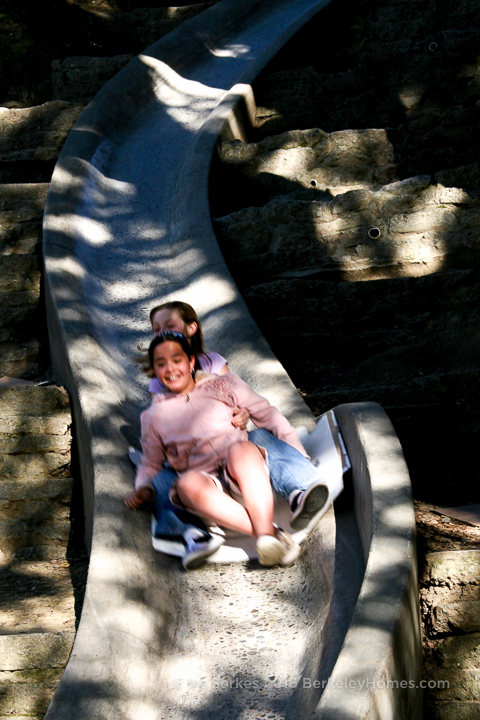 The concrete slides at Codornices and Dorothy Bolte Parks will lift your spirits. Yosemite features a recreated urn in Great Stoneface (yes, it does look like a face) Park at San Fernando; and the Frederick Mini Park at the Arlington. Thousand Oaks Park has a day-lighted creek, School House Creek Park has a commons, but the creek’s not been day-lighted yet. Other favorites … Bateman Mall, Solano-Peralta Park Halcyon Commons, Monkey Island and Glendale-La-Loma Park. 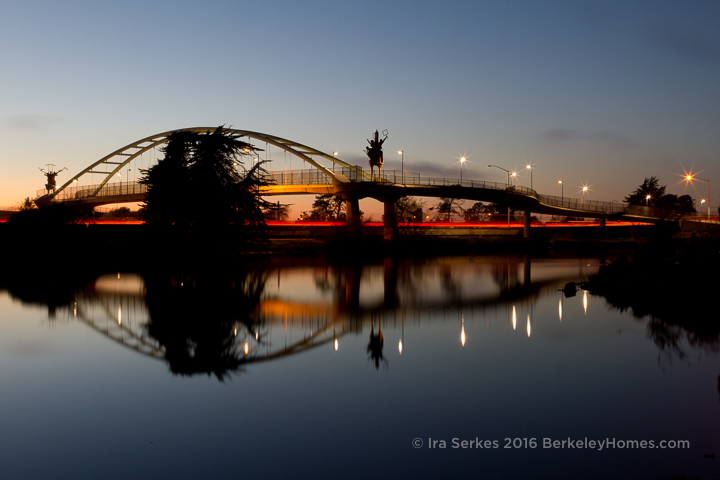 Berkeley did a wise thing when BART was developed – they chose to run BART underground and built Ohlone Park at ground level. Parks, Paths & More … we love living here and you will too!